I'm not much of a reviewer, but I finally decided to try it. It usually takes me 4-5 times with the same stick before I really feel like I have a handle on what I can detect in it, so take this whole thing with a grain of salt. Sat down at about 7:45 ish after a nice chili rubbed roast tri-tip dinner. The first thing I notice is that it's hard in some spots, and softer in others. Lumpy I guess. It smells like spice, and tobacco, with a slight barnyard aroma. I cut it with a guillotine about 1/4 of an inch in. Pre light draw is a bit tight, and tastes like spice and tobacco. I lit it with a torch, and right away the draw is too tight. Not enough smoke either, so I re-cut it, and the result is much better. Lots of smoke, and a much better draw. The first inch or so has very savory flavor to it, with pepper and cedar through the nose. There's also a slight sweetness in the flavor, and aroma. Parts of it remind me a little of the Serie V. I wouldn't say that it tastes/smells just like a V, but there are parts to the aroma and flavor that are reminiscent of it at this point. The ash is tight, and dense with no flaking. I put the strength at about medium full right now. The second third I'm starting to notice a coffee flavor. The aroma is still pepper and cedar. I like the way it smells. There's probably more to the aroma, but the wind is making it difficult to catch it all. After a while the coffee flavor becomes dominant, and the savoriness starts to disappear. The ash is still fairly tight with a few flakes. The burn is sharp, and cool. Haven't had to touch it up at all yet. Going into the final third is more of the same. A flavor mostly of coffee, and a peppery, cedary aroma. I'm sad the savoriness is gone. The ash falls at this point, and I give it a little touch up from the torch to even out the burn a bit. I still put the strength at about medium full, which I can feel in the gut. After a while I do start to get a slight nicotine buzz in the head, but nothing unpleasant. I'm a little over an hour into it and I give it a slight touch up. I'm also smoking slower now. I start to notice coffee in the aroma too now. I finish it up with about an inch left. Lots of coffee in the flavor, and the burn is getting hot. Total smoke time is about an hour and a half. 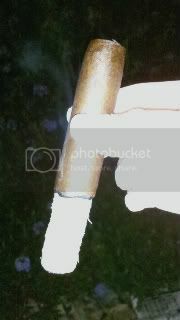 This was a good cigar, not great, but good. I enjoyed it. My only complaint really is the price. When I hear Nica Libre, I think 2-3 bucks a stick. This thing is 6, at box pricing. At that point we're awfully close to Ruination, or Serie V territory, and I'd probably rather pay the extra buck and have one of those. Now, if I could get these on a deal then I'd be more inclined to buy them again. I also worry that there might be consistency issues with this one. I don't have anything concrete to base that on, it's only a feeling. The reviews and comments I've seen on this stick are all over the place, and to tell the truth, this was the second Potencia I had. 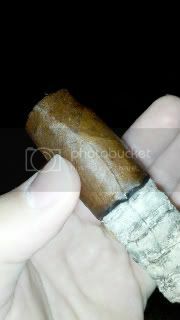 The first one I took out of my humi just before this one, and it was rock hard around the band. 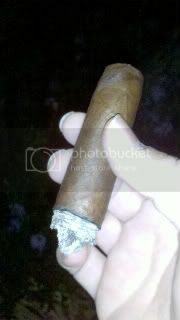 In the past a cigar like that has always been a very poor experience for me, but who knows, it could be fine. The second one was definitely good though. Thanks go to the Beard for this one. Russ, nice review. 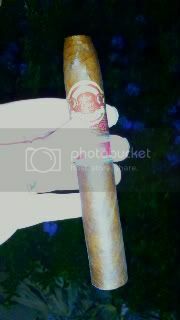 Never had one of those but, I do have some in the humi resting. Question, in your thoughts comment you state,"I also worry that there might be consistency issues with this one." Do you think it has aging potential, that with over time make it a delightful smoke? Thanks. To be honest, I really don't know what age will do to this. There wasn't a ton of spice in the flavor to reduce, and it didn't feel harsh through the nose. Age might mellow the power a bit, and I could see some considering this full bodied, so it might help there if they wanted less power. 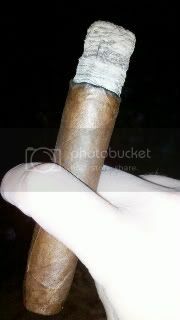 I smoked this one with one day of rest, so basically ROTT, and it seemed fine to me. I'll give the other one I have 6 months to a year and hope it's not plugged. Nice review Russ! I am on the final third of my first Potencia...a massive 6x60! I received it a couple months ago, and have no idea how long it rested prior, but the cello was starting to yellow a bit. I'm very pleased with it. The dominant flavors have been earthy, with some coffee and a bit of spice (not much). The burn has been a lil off here and there, but I kinda expected that from the 60 ring on a humid Georgia evening! Good review. I'm looking forward to reading your next review. It's all in the details and you seem to have A good handle on reviews.